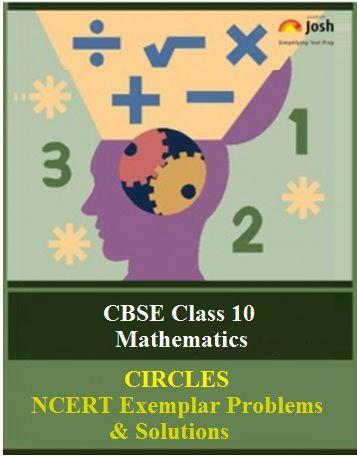 CBSE class 10 Mathematics NCERT Exemplar Problems and Solutions for chapter 9- Circles (Part-IIB), is available here. This part constitutes only the Very Short Answer Type Questions. Here you will get solutions to question number 6 to 10 form exercise 9.2 of NCERT Exemplar for Mathematics chapter 9. Question. 7 The tangent to the circumcircle of an isosceles ΔABC at A, in which AB = AC, is parallel to BC. Let DE be the tangent to the circumcircle of an isosceles ΔABC at A. Question. 8 If a number of circles touch a given line segment PQ at a point A, then their centres lie on the perpendicular bisector of PQ. Let circles S1, S2, S3, S4, ... with centres C1, C2, C3, C4, ..., respectively, touch the line segment PQ at a point A. We know that perpendicular on any point of a segment PQ may be only one. Therefore, all the line segments C1A, C2A. C3A,..., so on are coincident. But as A is not mid point of PQ therefore, perpendicular AB will not be the perpendicular bisector of PQ. Thus, the centre of each circle lies on a line segment which is perpendicular to PQ but not its bisector. on the perpendicular bisector of PQ. Let S1, S2 and S3 be the circles with centres C1, C2 and C3, respectively, passing through the end points P and Q of a line segment PQ. As we know that the perpendicular bisectors of a chord of a circle always passes through the centre of circle. Thus, perpendicular bisector of PQ passes through C1, C2 and C3. Similarly, all the circle passing through PQ will have their centre on perpendiculars bisectors of PQ. Question. 10 AB is a diameter of a circle and AC is its chord such that Ð BAC = 30°. If the tangent at C intersects A extended at D, then BC = BD.